Protesters Decry Funding Cuts At AIDS Conference : Shots - Health News The United States contributes a big portion of worldwide AIDS funding, yet the Obama Administration is being criticized for not doing more. 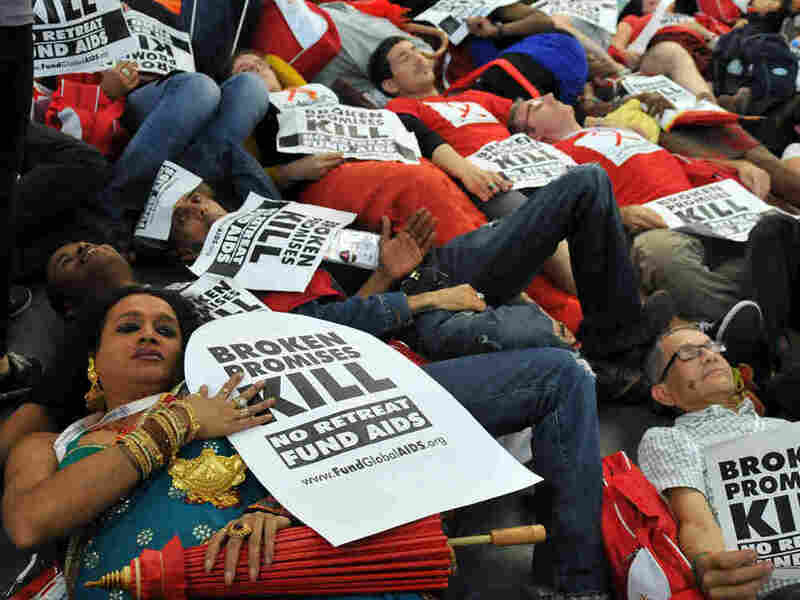 HIV AIDS activists lie on the ground as they hold placards that read "Broken promises kill no retreat fund aids" at the opening of the 18th International AIDS conference in Vienna's Messe conference centrum. The international AIDS conference, whic opened yesterday in Vienna, is a biennial affair that has morphed over the years from a mostly scientific confab into an information sharing forum for health and social workers from around the world. There’s never a shortage of colorful and angry protests at these meetings, and right on cue this year, activists from ACT-UP Paris disrupted a workshop even before the main conference got underway. Their charge -- that rich countries are turning their backs on AIDS -- is one that is being echoed throughout the conference this year. Indeed, the entire AIDS enterprise is getting pinched as several major developed countries have cut back their spending on foreign aid, including AIDS assistance. But by how much? UNAIDS and the Kaiser Family Foundation released the 2009 numbers on AIDS spending Sunday afternoon. After a number of years of rapid growth, AIDS spending shrank to $7.6 billion in 2009, down from $7.7 billion the year before. That sounds like a lot of money -- but pretty much everyone agrees it falls far short of the need. The World Health Organization said 10 million people should be getting HIV treatments right now. The worldwide total of people taking AIDS drugs stands at just 5.2 million, WHO says, with 1.2 million added in the last year. Treatment not only extends lives and reduces illness, health experts say it also helps control the spread of HIV. A new study from Vancouver published online Sunday in The Lancet shows the number of new HIV diagnoses in Vancouver dropped by half as the number of people in treatment grew. Who gets the blame for the stagnant AIDS funding? The Obama administration has been chided for essentially flat-lining the Bush administration’s AIDS budget for the developing world. The administration’s budget proposes that funding under the President’s Emergency Plan for AIDS Relief (PEPFAR), started by President George W. Bush, be maintained at last year’s level. Congress has yet to act on the matter. Administration officials say the criticism is short-sighted. A major makeover of America’s global health is just getting started, they say, with the aim of improving efficiencies and serving more people in need, not just those with AIDS. Their argument: Building basic health systems promotes maternal and child health, which helps people living with HIV and AIDS, too. "We definitely need to do more. And let me go on the record. I'm in total favor of universal access for everyone who's infected who needs to be on therapy. Is that going to be feasible given the current resources? No, it's not. So we have a problem, and I think to deny that there's a problem, is being unrealistic." As for how the U.S. stacks up against other countries, the UNAIDS/Kaiser report shows that the U.S. contributes 27 percent of global AIDS spending; the U.S. gross domestic product represents 25 percent of the world’s economy. That’s much better than most European countries, with the notable exceptions of the U.K. the Netherlands, and Denmark, which spend what some say is "more than their fair share" of their foreign aid budgets on AIDS. But even the Netherlands decreased funding last year. We’ll have other news from the conference as it happens this week and if you want to dive in deeper, the Kasier Family Foundation is webcasting many of the sessions here. We’re expecting to hear about some new strategies to lower the cost of AIDS treatment, ways to prevent HIV from spreading and speeches from former President Bill Clinton and global health’s chief financier, Bill Gates.